This document will walk you through changing your password in webmail. You can click on most illustration images to make them larger. In the below direction when you click the link it will open a NEW browser page. You will then have TWO web pages open. The one you just clicked will COVER this page. To continue the directions you will need to refer back to this page in order to proceed. This means clicking the tab at the top and toggling between the two pages. 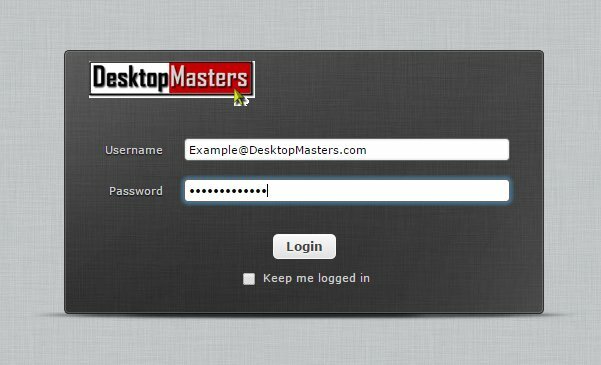 On this desktopmasters.com website click the gear on the right side of the gray tabs bar at the top of this page or from the main/homepage click “I am Already a Client”. You can also go directly to the chooser page from the address bar of your web browser (Like Internet Explorer) type http://WebMail.DesktopMasters.com or just click here. (The WebMail is a SEPARATE system from this website. If you try to login to THIS website it will not work. You MUST click one of the links and login where it says “WebMail”. You should now see the “Select Your Webmail System” dialog..
Click on the WebMail tile/link for "RoundCube"
RoundCube is now our primary Web Mail system. It used to be Squirrel Mail. We have switched. Login with your eMail Address and current password. Click the "Settings" button at the top of the page. On the left choose “Password”. Then, in the two boxes in the center pane type your new password. It can be anything 6 characters or more. It is CaSe sensitive and you cannot use spaces. It must contain at least one special character (above your numbers on your keyboard), at least one number, and at least one letter. There are programs/viruses that try to guess your password. If they succeed you will take down the entire mail system for everyone for days. This is why we try to make the password a bit more complicated. If you use outlook run it or click “Send and Receive”. When prompted for your password click the checkbox to save your password and password box type out your new password and press enter. If you have a Smart phone do not forget to change the password on that for incoming and outgoing mail as well. If you do not know how your phone company can usually help with that.